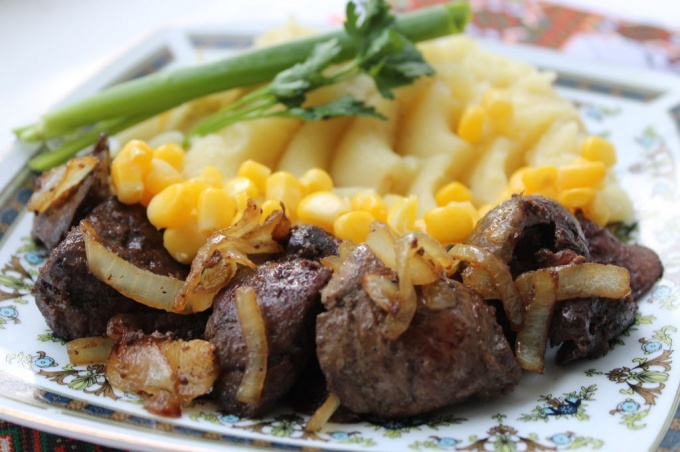 Lovers of delicious homemade food often ask how to cook liver, so it was soft and juicy. There are a few simple recipes that will allow you to achieve this and to please the family favorite dish. Soft and juicy chicken livers in sour cream is one of the most famous varieties of meals. Chicken liver is considered the most soft and pliable in preparation, so it is enough to wash to hold in cool water for 30 minutes, after which you are ready to begin cooking. Clean it from the bile ducts and films, cut into small bars. Season with salt and pepper. Cut into small cubes onion and carrot, then saute over medium heat until Golden brown. Roll in flour the liver slices and fry in vegetable oil in a separate pan until crisp. Add the onion and carrots, then simmer for 15 minutes on low heat, covering the pan with a lid. Periodically add a tablespoon of water to the dish did not burn well, and it was extinguished. Add to the liver 2-3 tablespoons of sour cream and simmer another 10-15 minutes, stirring occasionally. Check out the finished dish on the stiffness. If you want the liver was softer and more juicy, you can add 1-2 tablespoons of water and one to hold the fire longer, until the dish will not match the desired flavor. Pork liver has a high content of blood, which makes it more bitter than chicken. Rinse the liver, it steep in cold water for 1-1. 5 hours. Then remove the veins and rinse again under running water. Cut into small cubes, so that in future they are well cooked and become soft and juicy. Roll liver in flour, adding salt and spices. Heat a pan and fry the liver in vegetable oil. Please note that at this stage the dish should not be brought to a fully ready state, so take out the liver, when she will devote plenty of juice, and arrange on a plate. Cook the sauce for further stewing pork liver. Pour into the pan a glass of water, then bring to a boil. Add mayonnaise and sour cream, stir. Place in the boiling sauce over the liver slices and diced onion. Simmer for 20 minutes until the dish has reached the desired degree of softness. Beef liver is the most hard and bitter, however it is quite possible to cook delicious food in the form of so-called liverworts. Cook in salted water buckwheat. Clean the beef liver from the film, cut into cubes and soak in milk for half an hour. Cut the onions and carrots and fry in vegetable oil. Miss liver slices and vegetable sauté in a meat grinder or chop in a blender. The resulting mince mix ready and add salt to taste. Cut the pork fat grid squares 10 × 10 cm, Wrap them in a tablespoon of hepatic masses, making some semblance of cabbage. Billet fry in vegetable oil until crisp, then place them in a pot or heat-resistant form, zastelil her cabbage leaves. Pour in a bowl a small amount of boiling water, cover with foil or a lid and cook in a preheated 180 degree oven for 20 minutes.